In our new world of dueling central bankers, the ECB’s Mario Draghi has just called and raised the Fed’s Ben Bernanke in the game of stock index manipulation. Oh sure, the central bankers claim to be fretting about economics but let’s be honest. They have both expended everything they had in terms of economic juice. Neither can foster employment. Interest rates are at zero and will be forever. Both the ECB and the Fed have already bought multiple trillions of dollars in sovereign debt and trillions more in bad mortgages. And still, Europe is in a recession and the US probably is as well in a realistic sense. The trick these days is navigating through all the lies that our governments tell us. For instance, our government is maintaining a tale of an improving economy. Yet, the companies that carry the good of the economy are not echoing that tale. Fed Ex, UPS, CSX, and others have reported slowing business while offering lowered forecasts for the coming final quarter. The US regime also maintains that inflation is a no-show while corn and gasoline prices have risen better than 20% in the last couple of months. To make things worse, Friday’s employment report was again weak even by regime standards. They claimed that only 90-something thousand jobs were created while the unemployment rate fell from 8.3% to 8.1%. This is a well-practiced tactic of the regime. When the jobs number is bad, the unemployment rate drops. When the jobs number is better, they let the unemployment rate rise. Only a fool would believe anything that comes from a US regime. The truth is ugly. The truth is the US and Europe have both been allowed to live well beyond their means for the passed few decades enabled by debt. Now the debt is too much and it is unrepayable to the lenders. Good. They should all go broke for loaning too much money to bad credit risks. For instance, has anyone paid any attention the feckless US Congress? Why on Earth would anybody loan money to this completely incompetent body of legislatures? The only thing they are good at is abolishing liberties and imposing bans. Fiscally they are an abysmal failure. Yet, the US now has more than $16,000,000,000,000 in debt. In case readers are having trouble with all those zeroes, that’s $16 trillion. Europe is in even worse shape as they have decades of Obama-style ‘spread the wealth around’ under their belts. Naturally, the economies of both the US and the EU are in tatters. And naturally so, the stock indices that represent these two economies should be trying to find new lows to reflect the ultimate insolvency and dissolution of the unions. Sovereignty has already been surrendered to the central bankers. Ah, sweet surrender. Rather than face the truth or live in reality, the central bankers have accepted sovereign surrender in return for fantasy and lies. 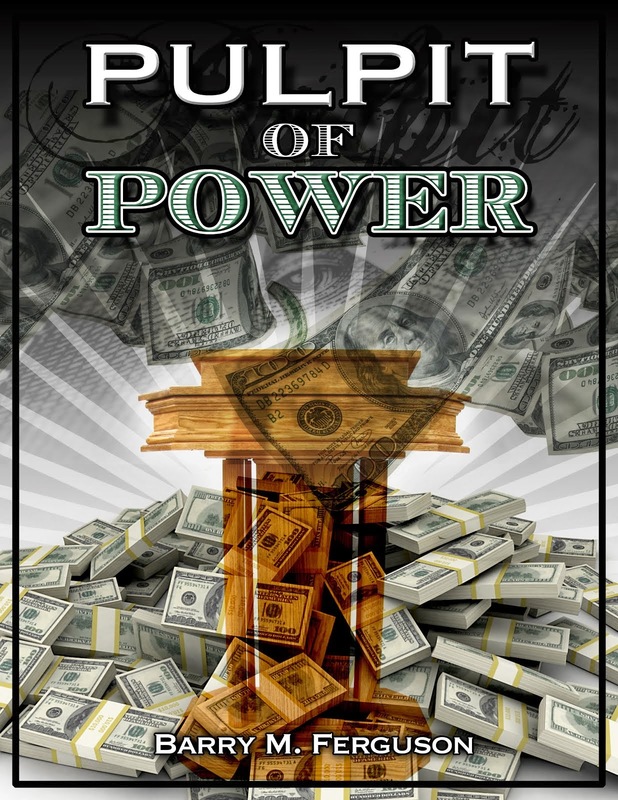 The bankers use the assets of the populace to fund sovereign debt purchases. That works to artificially lower interest rates so insolvent sovereigns can continue to borrow money without paying the price for their fiscal irresponsibility. For instance, a formerly sovereign nation like the US that is $16 trillion in debt and after another 4 years of an Obama regime will likely be north of $20 billion in debt should be borrowing money at something like 25% interest rather than the disingenuous 1.5% that is the current Fed manipulated rate. Ditto for the EU. Of course, interest rates this high would surely tank the stock indices and then even the dumbest of dumb would realize that the ‘economic recovery’ is completely dependent upon central banker manipulation. Even the stupidest of morons would eventually recognize this. Heck, at some point even a Pelosi would realize the scam at hand. The result of all this is we now have dueling central bankers. The Fed’s Bernanke ‘talked’ up the indices with pledges of eternal support this passed week. But then, the EU’s Draghi called Bernanke’s ante and raised him by pledging ‘unlimited’ bond buying in the land of the EU. According to Mr. Draghi, all a sovereign nation had to do was raise the surrender flag. Uh, I mean all they had to do was ask. Clearly, to have our veins flooded with all this central banker heroin, we must be in horrible shape. Without question, we are now addicted to such heroin. It should also be clear that heroin addicts never kick their habit by using more heroin. Draghi’s offer made stocks go up. That’s all that really matters, right? Of course. None of us care about freedom and liberty and capitalism anymore. The greatest bubble ever blown is being blown in stocks right now and we have a party to attend. We have already tied a rope around our arm and located a vein. That vein is the Dow Jones Industrial Average. All we have to do is push a little more of that central banker heroin in and we will feel elation. 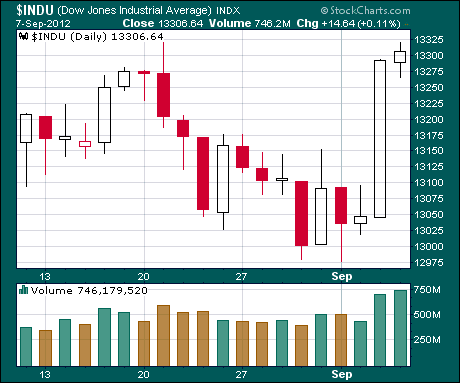 The chart below is the Dow. Readers have one guess as to which day followed Mr. Draghi’s announcement. Now, it is Mr. Bernanke’s turn.